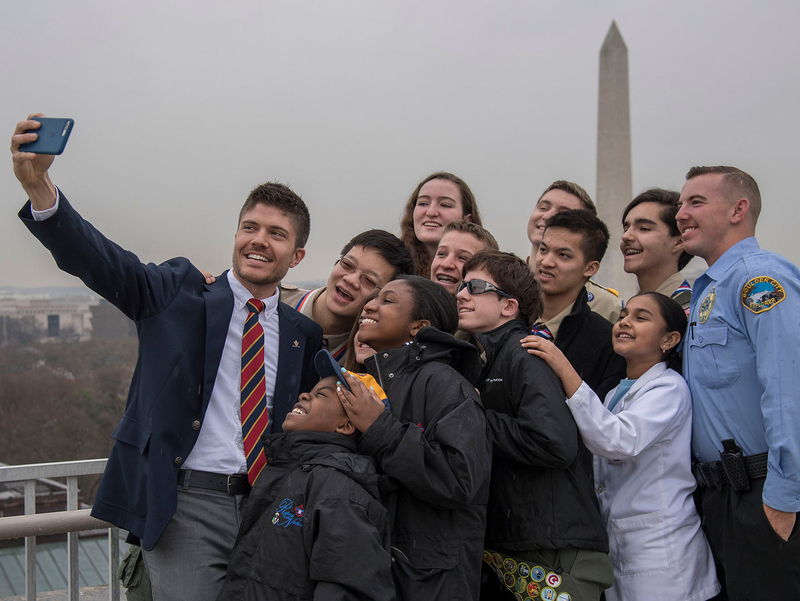 For Scouts and Scouters, it went to new merit badges, Eagle Scout journeys, the 2013 National Scout Jamboree, a nationally televised TV show about Boy Scouts, a family discussion on our membership policy, endless Cub Scout fun and so much more. It was a great year for Scouting. And for Bryan on Scouting. I’m so humbled that my blog recorded roughly 2 million page views in 2013, more than double the previous record of 850,000 from 2012. Thanks for making this a place you trust for Scouting news and conversation. The busiest month for traffic on Bryan on Scouting was July, which was also my busiest month as I took you inside the 2013 National Jamboree, the first at the Summit Bechtel Reserve in West Virginia. A month later, I served on Wood Badge staff, which was an experience I’ll never forget. I posted 275 times this year, covering anything I thought might be interesting and relevant with the goal of making your job as a Scouter easier. Note: Only posts that were published in 2013 are included. See the end of the post for some from 2012 and earlier that you were still clicking on in 2013. November marked 50 years since the assassination of President John F. Kennedy. And while other sites ably covered the news of that tragic day, I brought in the Scouting ties. You see, Kennedy was the first president to have been a Boy Scout. But his BSA ties don’t end there. Read the post. 12. Eagle Scout court of honor gifts: Are they appropriate? If so, what should you give? You give a graduate a gift when he reaches the high point of his educational career, but what about when a boy reaches the pinnacle of Scouting? In other words: To gift or not to gift, that was the question I answered in this May post. Read the post. The best Bryan on Scouting post to come out of the 2013 National Jamboree was one I didn’t write. It came from a mom who was worried the jamboree would be “too strenuous, too long and too difficult for my often-scattered and unfocused 12-year-old son.” As she found out, she was 100 percent wrong. Read the post. Does the Boy Scouts of America require uniform shirts to be tucked in? In October that answer changed from “no official comment” to “yes.” Read the post. Which merit badges had Scouts rushing to counselors and Moms and Dads rushing to the sewing machine last year? In April I gave you the full list and some takeaways, such as “Most, but not all, of the badges in the top 30 are offered at council summer camps, meaning it’s easier for a Scout to earn one even if there isn’t a qualified counselor in his troop.” Read the post. It’s a secret recipe no longer. In October I shared new details on Cooking merit badge, set to join the list of Eagle-required merit badges on New Year’s Day 2014. I included info on what’s changing and what a Scout should do if he’s started Cooking merit badge with the old requirements. Read the post. What do President Barack Obama, New York Giants head coach Tom Coughlin, author Homer Hickam, actor Chuck Norris and NBA legend Shaquille O’Neal all have in common? All have written congratulatory letters to Eagle Scouts, and all were featured in my March blog post. Read the post. The Boy Scouts of America isn’t above a good-natured joke at its own expense. That explains my April Fools’ Day post, written with the help of BSA Health and Safety team lead Richard Bourlon. In it, I joked that the “BSA is mandating a maximum blade length for knives used within Scouting.” That limit: 60 inches. Read the post. 3. BSA membership fee increased to $24; what does your $24 get you? When news broke in August that the BSA would increase its annual membership fee to $24 from $15, I knew Scouters would want to know what that $24 pays for. So I found out. I also researched how that $2 a month compares to other youth activities, such as tackle football or select orchestras. Read the post. Who knew a post about duffel bags would get so much attention? I certainly didn’t when in February I got my hands on one and posted a photo and description of the Osprey Transporter BSA. By the way, I still use this bag for travel six months later. Read the post. Good news always wins. 2013’s most-read post was the story of Connecticut Scouter Gary, who had just finished a “wonderful week serving on the national jamboree staff” when he returned to the mall parking lot where his car had lived for the past two weeks. When he spotted his car, his heart sank. What happened next will renew your faith in mankind. Read the post. What were 2012’s most-read posts? So glad you asked. Find that rundown here. What stood out to you in 2013? What were your best moments of 2013? I’d love to read your reflections in the comments.